This beautiful new image, taken during a time lapse set at the Atacama Large Millimeter/submillimeter Array (ALMA) is another dramatic Ultra High Definition photograph from the ESO Ultra HD Expedition. ALMA, located at 5000 metres above sea level on the remote and empty Chajnantor Plateau in the Chilean Andes, marks the second destination for the four ESO Photo Ambassadors  on their 17-day trip. The ambassadors are equipped with state-of-the-art Ultra HD tools to help them capture the true majesty of sights like the one pictured here  . Some of the 66 high-precision antennas that comprise ALMA are visible here, with dishes pointed aloft, studying the cold clouds in interstellar space, and peering deep into the past at our mysterious cosmic origins. 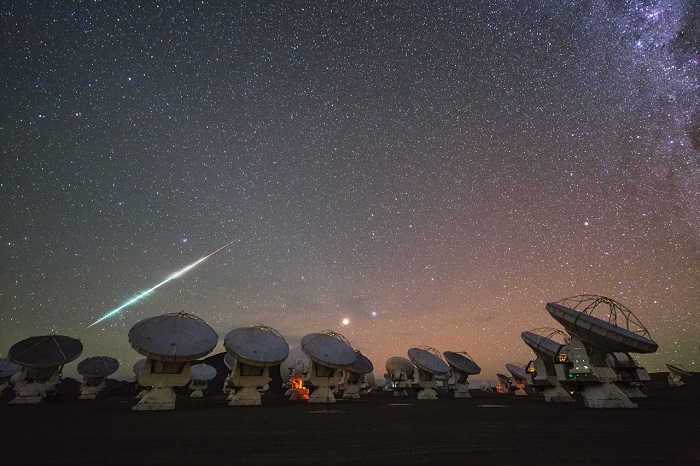 The spectacular javelin of light over the ALMA array is a shooting star, slicing through the image in a vivid streak of colours. Emerald green, golden and faint crimson hues blaze brightly as the meteor burns up as it enters the Earth’s atmosphere and makes its fiery voyage across the sky. 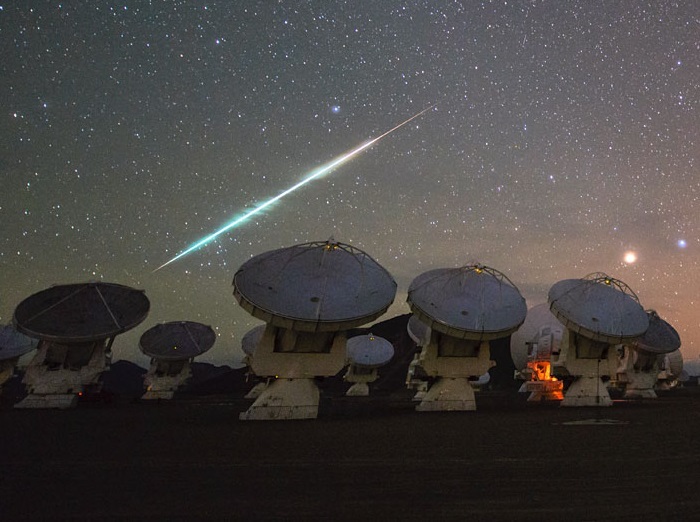 As the high-speed fireball — which is, in reality, a small grain of rock from interplanetary space — interacts with the atmosphere it heats up, vapourising the surface layers of the meteor, which are left behind in a glowing trail. These trails disappear in just a few seconds, but are captured here at the click of a button. The brightest star in the constellation of Virgo (The Virgin), known as Spica, and our neighbouring planet Mars glow brightly in the centre of the image — cosmic spectators to this fiery descent as they rise above the horizon. The Ultra HD Expedition began in Santiago, Chile, on 25 March 2014. This image was taken on the team’s eighth night on the Chajnantor Plateau. They are currently at La Silla Observatory, ESO’s first astronomical installation in Chile, and tomorrow, after one last night, they will finally make the long journey home. Free Ultra HD content gained from this expedition will soon be available online as ESO delivers crisp, breathtaking Ultra HD footage — bringing the Universe closer than ever before. This image was taken by ESO Photo Ambassador and Timelapse Cinematographer Christoph Malin. The team is made up of ESO’s videographer Herbert Zodet, and three ESO Photo Ambassadors: Yuri Beletsky, Christoph Malin and Babak Tafreshi. Information on the expedition’s technology partners can be found here, and their blog here. Equipment includes: Vixen Optics Polarie Star Tracker, Canon® EOS-1D C camera, Stage One Dolly and eMotimo TB3 3-axis motion control camera robot, Angelbird SSD2go, LRTimelapse software. Peli™ Cases, 4K PC workstations from Magic Multimedia, Novoflex QuadroPod system, Intecro batteries and Granite Bay Software.